Since the end of the 1970s students and teachers of the ⇒Vocational School Altötting have successfully been involved in diverse aid projects in Peru, Tansania and Togo. Thereby they have become aware of the complex of problems caused by the crisis of fuelwood with all its detrimental effects on humans and environment. To meet these increasing problems they were happy to adopt the parabolic solar cooker developed by Dr. Dieter Seifert and integrate it into the developing aid activities. In consequence EG Solar e.V. was set up in 1993 as a non-profit registered association. EG Solar actually has 160 members worldwide. feedback from many regions of the world, reports and photos of solar energy applications under various climatic and cultural conditions help us. 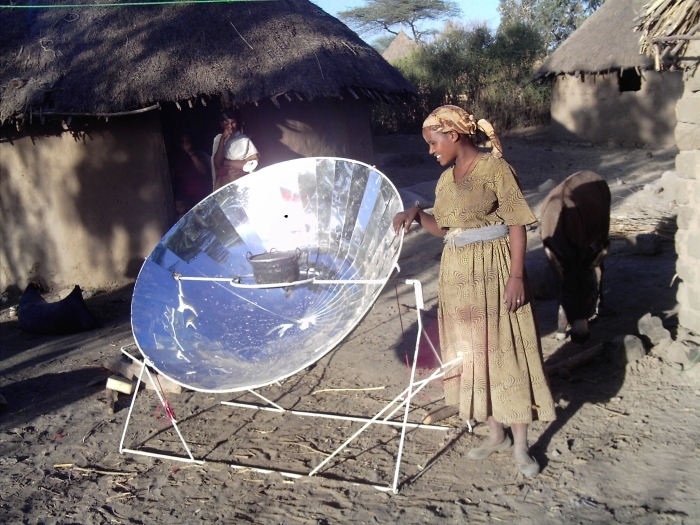 Why is the spread of solar cooking so important? Two billion people worldwide depend on firewood or charcoal to cook. The secondary growth of wood can not keep up with the consumption. The consequences of deforestation are dramatic: treeless steppes, soil erosion, sinking of the groundwater level, impoverishment of soils, desertification, rural exodus ..
High CO2 emissions and soot damage the climate. 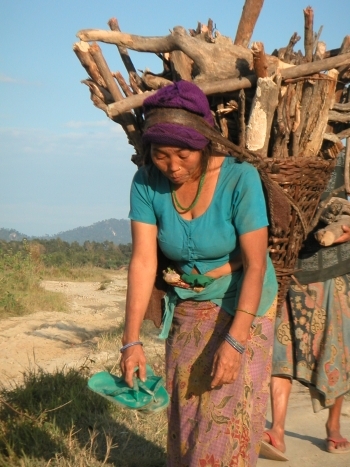 Women and children must always take additional steps for firewood collection. Landmines are often a high risk. The increasing fuel shortage leads to horrendous prices for fuels. Toxic smoke and soot from traditional cooking places damage the eyes, lungs and airways. Relieves women and children from the time-consuming collection of wood. Children find time to attend school, women work. creates jobs in the field, thus becoming affordable for local people. for commercial purposes such as tea and food stoves, coffee roasting, dyeing, braiding is possible. Improves overall living conditions in the countryside and prevents from rural exodus. 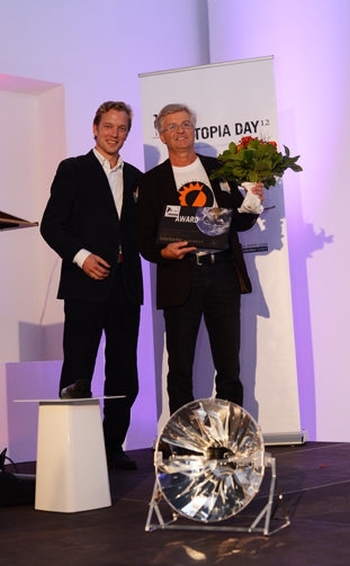 Laudator Leonhard Graf von Harrach, Head of the Tesla Germany (on the left), congratulated Hans Michlbauer of EG-Solar e.V. for the first place and appreciated the realization of a visionary idea. The Solar Cooker is a serious alternative to the use of fossil fuels in an activity that daily translates into billions of people: cooking. 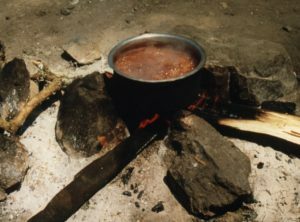 As such, the invention particularly relieves women and children in countries with a lack of fuel from daily wood gathering and from harmful foodstuffs in smoky smoke. The association provides support to people in need around the world to help them live a decent life through self-help. The association is selflessly active and pursues exclusively and directly non-profit and charitable purposes within the meaning of the section “tax-privileged purposes” of the tax regulations, it does not pursue primarily economic purposes. Promotion of economic and social self-help projects in the field of environmental protection, in particular the use of solar energy for cooking purposes. This is done by means of technology transfer, where necessary also by direct financial and material support of corresponding projects. Recipients of grants pledge themselves to make an account of the use of the funds. The practical transfer of necessary technical skills in this field, which are also suitable to improve or open up new opportunities for the individual.